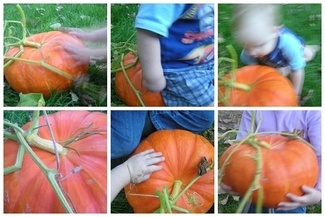 We got only one pumpkin in our garden this year. Just one little volunteer plant that didn't get eaten by slugs. This pumpkin is beloved already. It has been carried, touched, patted, pushed, kissed, and sat on. Princess really really wants to turn it into pumpkin pie, though, so we'll see how long it lasts! A bag for a bridal shower. Getting psyched up/mentally organized to start school for Princess on Monday. A bag for a swap. He goes in there anytime I'm not looking. 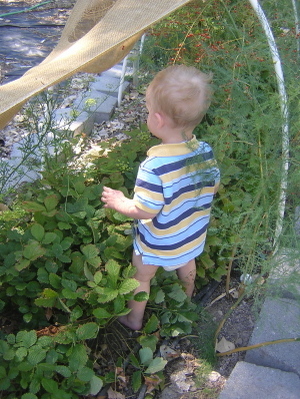 Here he is standing in the middle of a strawberry patch, trying to scavenge. This kid loves the garden, and especially the berries. When Aaron got home the other day, Monkey said "Lettuce" and got Aaron's shoes back out for him to put on. He wanted to go out to the garden and water the lettuce, which Aaron usually takes him out to help with.